This week has been spent polishing our game design document before the deadline. Since we’ve prioritized the document, I won’t be programming until friday – so this week I’ll take you through how I wrote the aesthetic goals document! Disappointing, huh? I bet you couldn’t wait to hear vague descriptions of vectors and pointers and recursive functions! So this week I’ve been working on some level design to replace the current placeholder level, expanding the waypoint system for the pathing ai, and adding some lootable objects. The lootable objects comprise our game’s “power-ups” (a minimum of three powerups was part of the assignment criteria). As our thief explores the mansion looking for valuable items to pocket and pilfer, they may come across larger objects that result in special effects while being carried. This week I’ll be discussing the use of waypoints as a method of pathfinding for our enemy AI. Taking last week’s CONCRIT into consideration, I’ll try to explain the how and why of my programming in a simplified manner that non-programmers can more easily follow along with. For this week’s discussion, I’ll run through how I started work on a form of pathfinding for our enemy AI. In Introduction to Game Development, students are to select a game concept created by another group in the previous course, and turn it into a fully playable game. 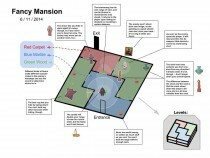 Our group selected Fancy Mansion, a concept developed by classmates for a stealth game aimed at a younger audience. Huff puff. Last night of work on our final assignment for Game Programming I. Spears were shaken, shields were splintered, a sore night, a red night, and the sun rises. Addressed an animation bug that was locking directional movement on a single frame (animations were being set to a null value if the player was standing still, in order to preserve the directional the player was last moving in. This was addressed by setting the last direction check after the player stops moving to a nonsense value. This prevents smooth animation (frame continues where it last left off if you stop moving) but also removes the movement bug. Closing in on the hand-in date for our final assignment in Game Programming I! Work continues on our final assignment for Game Programming I. Went over how my partner wrote the Room manager. He took inspiration from the Sprite Manager and made use of enums (he will add documentation eg comments to his code). Met up on voicechat to organize, go over what has been done and plan for the next few days. My partner suggested tiling for the background. Seems like a very good idea! Generate a room by reading in characters from a text file. Partner went over animation again for me. Workin hard or hardly workin? Our final assignment for Game Programming I is to recreate a mockup or clone of a classic arcade or console game, such as Frogger, Pacman, Tetris, Galaga, etc. My partner in arms and I decided to challenge ourselves a bit and go for Legend of Zelda ’87. The holidays perhaps aren’t the ideal time for lots of coding, at least for a newbie like me! December 16, 2014 / Comments Off on Workin hard or hardly workin?